Abram S. Hewitt State Forest is located in Hewitt off of Warwick Turnpike. The forest can be reached by taking Route 23 to Union Valley Road into West Milford. At the light past the town hall, bear left and continue on Union Valley Road. At the next fork in the road, turn left onto White Road and at the next intersection turn right. Parking is along both sides of Warwick Turnpike. Trails start near stream. Rocky outcrops and upland swamps characterize Abram S. Hewitt State Forest. Upon entering the forest, the Appalachian Trail ascends to Bearfort Ridge. 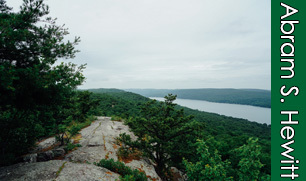 The glacially carved ridge offers spectacular views eastward along Greenwood Lake. Bearfort Mountain is the eastern terminus of the Wawayanda Plateau. At this point, the Appalachian Trail leaves New Jersey and enters New York. 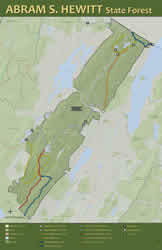 Hiking trail maps available at Wawayanda State Park Office. Parts of Abram S. Hewitt State Forest are open for hunting. For information about hunting, refer to the New Jersey Fish and Wildlife Digest or contact the Wawayanda State Park office.